Spend enough time on the water, and your equipment will spend some time in it. 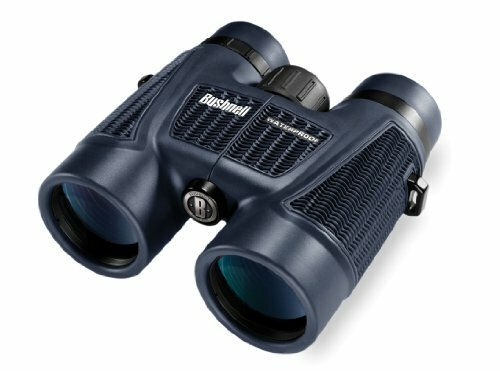 That’s why Bushnell had the foresight to build the H20 series of binoculars, which are O-ring-sealed and nitrogen-purged to complete lock out moisture should you spill water on the housing, take your binoculars overboard, or simply run into foul weather along the way. The H20 binoculars feature rubber armoring with textured pads to give you a sturdy grip in slippery situations. More significantly, the binoculars’ multicoated optics and premium-quality BaK-4 prisms maximize light transmission and image clarity, so you can enjoy a clear view of the Orcas in the distance or the fast-approaching coastline. You’ll quickly see how a little planning on Bushnell’s part goes a long way in magnifying your adventures on or around the water. Other features include twist-up eyecups, a large center focus knob for easy, precise adjustments, and a long eye relief.